Usually a race report is one of the easier posts to write. It is just a matter of taking a few moments to relive the race mentally, then transcribe those thoughts, feelings and emotions into a race recap. It could be as short as 18 minutes of racing if we’re talking about a 5K. 38 minutes if it is a 10K race, perhaps an hour and 25 minutes for the half marathon. The mother of all race reports – a full marathon – is just a little over three hours of memories and feelings to cycle through and attempt to capture what the experience was really like. Well this race report is not like any that have come before it. 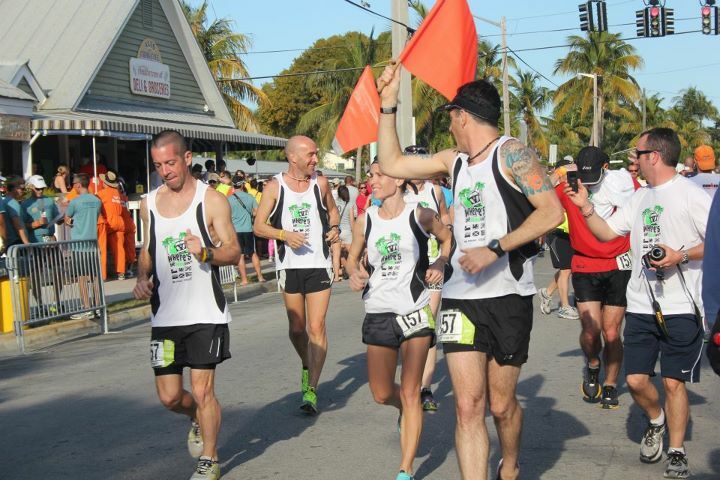 Not even last year’s Ragnar adventure from Wickenburg to Tempe compares as this year we stared directly into the belly of the beast and decided to take on the 199-mile challenge from Miami to Key West as an ultra team. As an “Ultra” entry we would have just 6 runners racing around the clock this year with no time “off” as the other half of the team ran while we rested. In fact the 6 of us “were” the other half of the team. Runners 1 and 2 were – Me. Runners 3 and 4 were – Steve Spiers. We had the option of running our legs individually, meaning we would be running every 6th leg of the race or “doubling up” our legs and running them two at a time. Both options had their pros and cons. If we decided to run singles, we would have to warm up and cool down for 6 different runs, with less down-time in between each effort. The distances would be shorter for each run, but they would be twice as frequent. If we decided to run “doubles” we would run consecutive two legs at a time, making the distances longer, but reducing the amount of runs to only 3. Just 3 warm-ups and cooldowns and our portion of the race would be over. We opted for the second scenario – as we felt we would get more time to rest and recover between efforts. We would also have to run the individual legs at a slower pace to make sure we saved enough energy for the closing miles. In hindsight I still feel like we made the right call, but there were a few moments out there where I certainly was questioning our sanity. But we’re starting to get ahead of ourselves and I want to make sure we don’t miss anything. 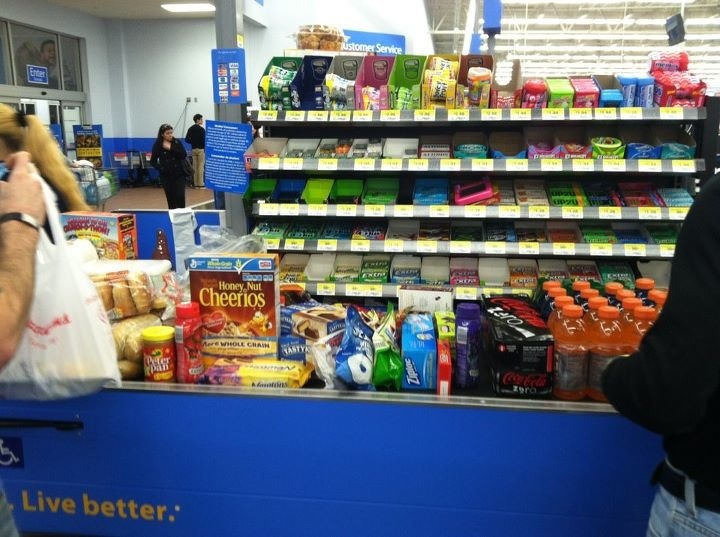 Preparations – Supplies and Van Decorating: On Thursday night we fought through Miami Traffic to the local Wal-Mart to stock “The Damn Van” with all of the supplies that 6 hungry, thirsty and tired runners would need for a 30 hour journey as well as the Damn Van driver John. Bagels, peanut butter, energy bars, energy drinks, bottled water, salty foods, sweet foods, crunchy foods, Cereal, Twizzler, M&M’s, Tastycakes, paper towels, baby wipes. Lots of baby wipes. trash bags, another Garden Gnome for the van, paint markers – essentially everything and anything we may need to keep us hydrated, fueled up and entertained from Miami to Key West. By the time we were 40 miles from the finish line, if I never saw any of those items again it would be too soon. 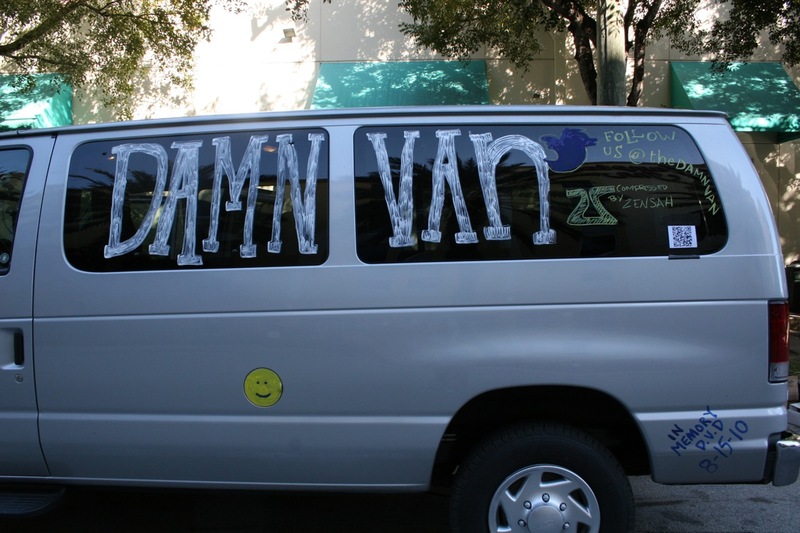 Friday morning we started the process of transforming our Silver 12-passenger van into “The Damn Van”. 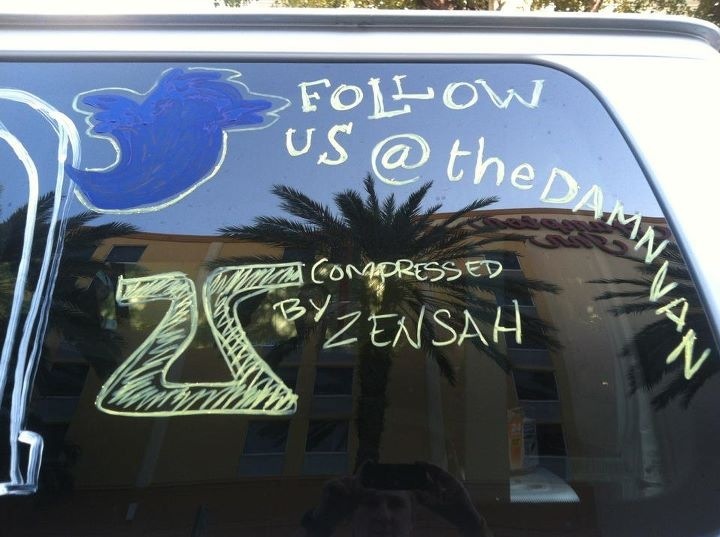 And of course a shout-out to Dom on the bottom right of our transportation that would take us all the way to the keys. We were ready to go. The Set-Up: Our six-person “Ultra” team after submitting our projected paces to the Ragnar Staff was awarded a 1:00 p.m. Starting Time on Friday Afternoon. The first “wave” of teams start at 5:00 a.m. on Friday morning, the final “wave” of teams start at 3:00 p.m. Ragnar starts teams that plan on running a slower pace earlier in the morning and those teams running a faster pace later in the day. The idea being that the faster teams will catch up to the teams ahead of them, allowing for everyone to finish at approximately the same 2-3 hour window on Saturday afternoon. This helps organize exchange areas, volunteers, the finish line festival, Medical Staffing and all of the variables you have to account for in organizing a 199 mile point to point relay race with 517 individual entries and more than 5,000 runners. We arrived at the starting area to attend the safety meeting, pick-up our race bibs, our slap bracelet, our caution flags to be used when we exited our van throughout the race and other odds and ends. We also needed to show the Ragnar staff our headlamps, rear red lights and reflective vests that needed to be worn by all team members between 4:00 p.m. and 7:00 a.m. whether you were the “on” runner or not. Safety is obviously the primary concern when an event like this is being planned. The folks at Ragnar do a great job of providing a safe environment for the race. They have a text message system to alert teams of any problems on the course, and will notify you if you are breaking any rules on the course. Truly top-notch the folks at Ragnar. We got six #157 Bibs – trimmed in Green to denote we were an ultra team in lieu of the orange-colored bibs for the 12-person teams and it was time to get ready to rumble. 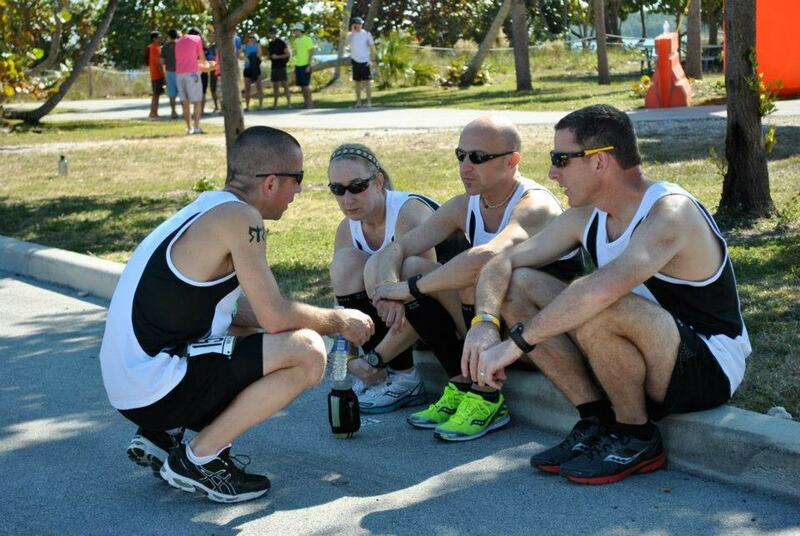 Pre-Race: Many of my teammates would not be running for several hours, so the mood was light for the most part. As pictures were being taken and some general laughing and joking around was happening I was starting to feel the pressure of the race begin to mount. Normally before a race I don’t spend much time talking – I spend most of it running over my race strategy in my head, thinking about my opening mile and I go for a short warm-up to make sure my legs are ready to go. Knowing that I would be covering somewhere around 36.5 miles over the next 17-18 hours made me hesitant to do too much of a warm-up, but I wanted to jog just an easy mile to calm the nerves and remind my legs what we were there for. After a couple of team photos, I snuck off for a quick quiet moment alone to tick over the legs. They called the first runners on the teams to the starting area and I assembled with the other 10 1:00 p.m. team entries. There were a couple of other “Ultra” teams there, but most of the runners were running with a 12-person group. I had not decided on pace in any real way. I thought I would just run free and easy over the first leg and then see where we were around the midpoint of this first run. 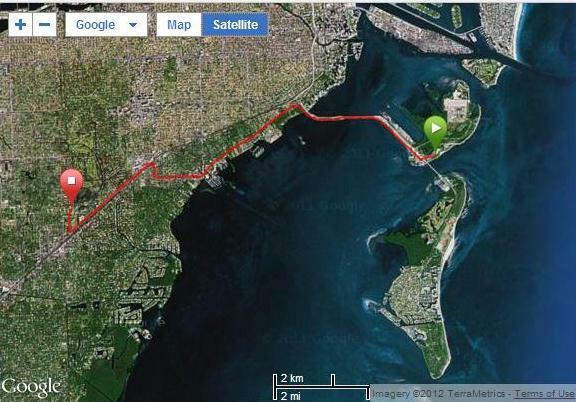 The breakdown was 5.7 miles out of Virginia Key State Park, over the causeway bridge and into Miami. 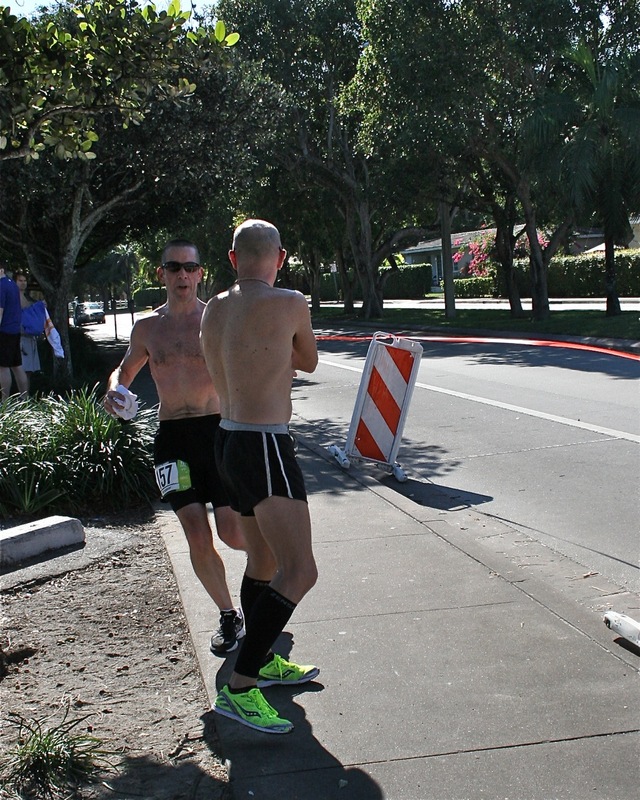 After coming through the first exchange area, I would continue on the course without stopping for another 4.4 miles to the University of Miami Campus. Once there I would hand off to Steve Speirs and he would take off on his own adventure. There were a couple of runners that seemed to be wanting to go out around 7:00 min./mile. I thought that would be a good place to start and back off once we settled in a bit. I surely wasn’t going to open up the race with 10.1 miles at under 7:00 min./mile pace knowing I still had more than a marathon remaining. The race director had the crowd at the start area count down from 10 and at the sound of one we were off. We ran out of the start area and I passed my teammates on the left side of the road way, we snaked our way out of the park, crossed over to the left side of the causeway with help from a police officer and made our way toward the bridge. What in the hell was I doing. I made an adjustment in my stride length, kept the breathing free and easy and slowed things down. I just focused on my cadence and settled in as we approached the bridge. None of the runners were talking up ahead of me, everyone doing their own thing, so I just stayed even and didn’t worry about looking at my wrist. My teammates had piled into the van and as they passed along the roadway on the right they honked the horn and yelled encouragement out the windows. Something that we would do literally 50 or more times as we made our way to Key West. At the base of the bridge I had stayed comfortably in contact with a group of three runners ahead of me. One very fast 12-person runner sped away from us and he was already near the top of the bridge, he had to be running something around 6:15 pace. As the incline started to steepen, the other runners came back to me. I wasn’t working any harder, but my pace was steady, a testament to the hundreds of hill repeat we have covered over the past year and a half. After we sped down the other side of the bridge the course flattened out and we made a left hand turn to run along the sidewalk toward the first exchange area. I was running with a woman named Sue O’Hara. A 52-year old track coach at a local Catholic High School. Sue’s Marathon PR of 2:43 was pretty darn impressive. We talked a bit about the race, our marathon experience and how we were feeling. As we got closer to the exchange point I mentioned that I had another 4+ miles to go after we reached it, and she looked over at my green bib. “You’re running great, keep it going” – she told me. In my mind I was thinking, “you are going way too fast too early you knucklehead”. Enjoy the way these miles feel now, because you are going to pay for it later. As we approached the exchange area a Ragnar Volunteer called out my bib number to the runners up ahead. This is done to alert the other teammates that their runner is approaching and to have the next person in line ready to go. As I heard them call “#157” out – my heart sank just a bit. I wouldn’t be passing off the slap bracelet, I was just a little bit more than half-way there. Sue stopped to hand off to her teammate who immediately fell behind me. I was running alone and with the exception of a runner that I could see far up ahead of me, I was on my own to navigate the course all the way to the University of Miami. I’m sure at this point you are picturing a beautiful scene. Blue sky, Palm Trees, a runner ticking off the miles effortlessly. Nice image. Just not accurate. The sun was high in the sky and my singlet was sticking to my chest, I pulled it off and all of the moisture wiped across my sunglasses, leaving wet streaks to look through. The area we were running through was not exactly “picturesque”. There was foot traffic, car traffic and around Homestead, certain drug traffic going on around me. I was zigging and zagging through a crowded pedestrian area for the better part of a mile and a half, paying close attention to cross walks and traffic lights. With approximately 2.5 miles to go I had to cross over US-1 by way of a pedestrian footbridge. This meant slowing to a near stop and going up 24 stairs, running across the pedestrian walkway high above the highway, then back down 24 stairs on the other side. Not a lot of fun in the best of circumstances, but certainly not a lot of fun 7.5 miles into a run. Finally things looked up a bit from a traffic perspective as we neared the University of Miami Campus. I made the final turn to the right and ran through to the exchange area where Steve Speirs was waiting for me. I slapped the bracelet around his wrist and just like that Steve was off. Run number one was in the books. 6:41, 7:03, 6:44, 6:59, 7:17, 7:10, 6:40, 7:18, 6:54, 6:51 and the final .31 at 6:55 pace. My first run came in at 6:58 pace overall. A good :15 seconds faster than I had tentatively planned. Not the smartest thing I ever did, but there wasn’t very much I could do about it at that point. Just change clothes, grab a Gatorade and move on to the next one. Into the Damn Van I went. Each of my teammates took to the course and did their thing. Run after run, stop after stop and by 4:00 p.m. Steve, Thomas and I had completed our first runs. 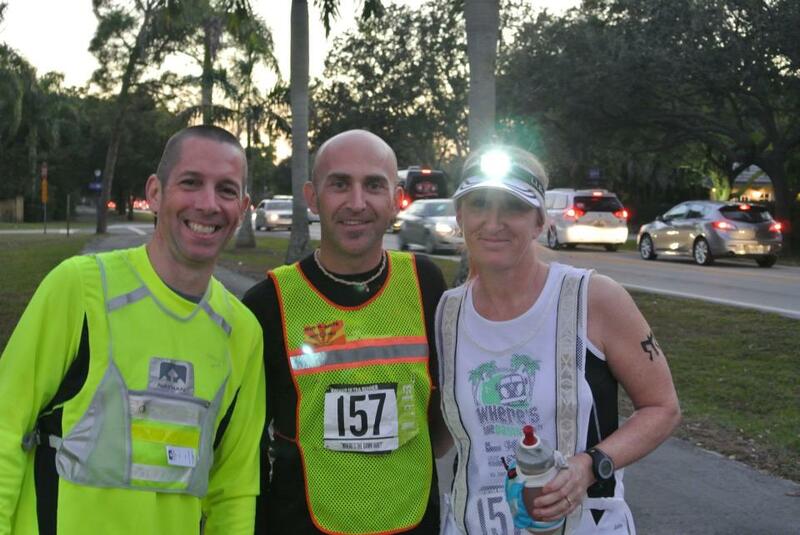 It was time to get on the reflective gear and get ready for the long night ahead. 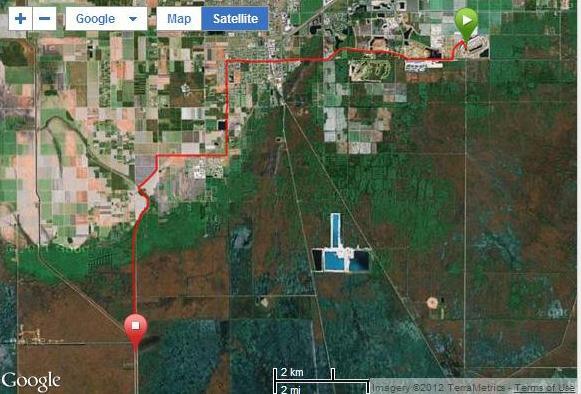 It looked like I would be off until about 8:00 p.m. where I would be running a large portion of my 13.5~ mile run “off-road” along the canal road and into the Everglades. Steve Speirs would follow-up my run with a combined 20 miles through the same area. More than 33 miles through the swamps of Florida, in an area remote enough that Steve and I were required to sign an additional safety waiver – quite literally referred to as “The Alligator Waiver”. I’m not sure entirely what we were agreeing to, but I do know that we spoke about the need to run in a zig-zag pattern if we were to come across one of those critters as they cannot cut and weave at all. They can only run in a straight line. Steve and I spoke about pace again in the van before our legs. We both told each other we would take it easy, but I think we both knew that we were full of sh#!. I was going to do the same thing as Steve. I was going to run at a slightly uncomfortable pace and try to hold it steady until it was time to stop. Pretty much the recipe at every race you run. To me, this was the key leg of the race. I would be able to knock out the last one if for no other reason than knowing it was the last one. This one however was going to be rough. Sean Brown appeared right on schedule. The nice part about this leg was it started at the Homestead Race Track. As Sean entered the area, they called out our number. Sean would have to run more than a full mile around the NASCAR track before he handed over the slap bracelet. I waited in the warm van until we heard our number called, I then was able to load up my water bottle and make a quick stop at the bathroom. I got all that done in plenty of time for Sean to come through Pit Road and hand off to me. Just like that I was leaving Homestead towards the Everglades. This run started innocently enough, I ran out of Pit road, up through the tunnel that they use to bring the race cars into the track and then made a left turn onto a nice, smooth asphalt path that led out of the Raceway area. I settled into a comfortable pace just a tick or so under 7:00 min./mile and decided I would hold on right there until we reached the canal road if I could. That would be roughly the half-way point of my night-time run. If the path was as rough as they said it was, I would have to slow my pace down to navigate all of the ruts and potholes. I wanted to run some quality splits while I could and my legs felt relatively fresh. There was very little in the way of signage over these first few miles. I could see a faint, tiny, blinking red light up ahead – perhaps 1/2 mile or so that had to be another runner. I just stuck to the “obvious” course and hoped that I was going in the right spot. After a very uneventful 6-miles there was a RAGNAR RACE sign that pointed to the RIGHT with a red light flashing atop it. I made the right turn and took a few strides off of the asphalt and onto a crushed stone path. Things were about to get very different from here on out. I ran on for about 1/2 mile when I noticed a second sign that instructed runners to turn LEFT. Up ahead I saw another runner’s tail light flashing who had missed the turn. For a split-second I doubted what I should do, but I thought the chances of him or her being lost was far greater than the sign being wrong – so I made the left turn and hoped for the best. The canal road started to narrow, perhaps only 8-10 feet wide at this point and littered with ruts and potholes. I found myself zig-zagging back and forth looking for smooth footing, but every so often I would misstep and get knocked off stride. I stopped worrying about my pace and started worrying about making it through the end of this double-leg healthy. Later I would learn that several runners took a tumble over this section, cut hands and knees – it was definitely treacherous. I hit the exchange area and powered right on through. Just 4.7 miles left until it would be time to hand off to Steve. For this stretch the road was a good bit wider and the runners would be sharing the canal road with the team vans. As each van approached their headlights would illuminate the road which was helpful, but as they passed they kicked up an enormous amount of dust, that would cloud your vision through your headlamp. Mile after mile I kept looking for our van to pass me by, and as I got closer to the exchange area I started to get very nervous. The vans could only drive 10-15 miles an hour through this section so as not to disturb the runners. I began to wonder if Steve would be waiting for me or not at the exchange. With a mile to go I stepped into a rut and turned my left ankle. It wasn’t too bad I thought as I caught myself before I really came down hard on it. Less than 20 strides later, I turned it again. Son of a @$#%! It seems like that is always the way it goes after you misstep, you always have another one on that same foot within a few hundred meters. With less than 1/2 mile to go I was thinking about the fact that I still had not seen the Damn Van pass me by and I did it again. I stepped right onto a loose stone in the middle of my foot and it spun out and turned my left ankle for the third time in less than a mile. Up ahead I could see the bright temporary lights of the exchange area and I knew I was almost there. Just then, with less than 2/10 of a mile to go the Damn Van passed me on my left. As I pulled into the parking lot I could see the side door of the van open up and Steve hopped out ready to run before the Damn Van had even stopped moving. I slapped the bracelet around his wrist and just like that Steve was off. Run number two was done. The course measured a bit long again – a total of 13.72 miles covered in 1:38:08. 6:57, 6:58, 7:03, 7:01, 7:01, 6:55, 7:01, 7:10, 7:07, 7:15, 7:22, 7:21, 7:30 and the final .72 at 7:27 pace. My ankle was a bit sore, but all in all covering that run in 7:09 pace was pretty solid. I walked over to the EMS person and got a quick snap ice bag to put on my ankle and hopped back into The Damn Van. Time for yet another bagel with peanut butter, more Gatorade, a power bar and a few handfuls of Peanut Butter Captain Crunch. Dinner of Champions. I washed that down with some more Gatorade and a Turkey Sandwich that the guys picked up for me while I was running. I was trying to keep track mentally of my calories in vs. my calories out – but I felt like I was losing that battle. Rehydrating before my final run in the morning was going to be important as the sun was sure to be shining and it was going to be a hot one on Saturday running across the 7-mile bridge. Run Number 3 – 7:58 a.m. Saturday Morning: We continued on through the night as Steve, Thomas, Jenny and Ally took to the course. Jenny had a bit of a mishap as when she was crossing an intersection a car waved her through. Behind that car was a Ragnar sign that was instructing runners to turn left. She never saw it. She ran one mile down the road before turning back, knowing that she must have missed a turn. She ended up running an extra 2-miles, turning our 199 mile adventure into 201. It’s all part of the deal with an overnight relay. The sun was up now as Sean took off for his second run. The temperature was rising quickly as was the sun off to the East or Left side of the course, slightly behind the runners as we were headed due South along the side of US-1. I debated what to wear for this leg, whether I should run shirtless or with a singlet, but I decided that I would put on my Brooks Marathon Maniacs Singlet to keep a little bit of sun off of me. I had a short 3-mile opening segment, then I would run through exchange 26 and straight into a 9.1 mile stretch that took us up and over the 7-mile bridge. The first three miles were going to be fast, flat and smooth. At this point in the race we had caught up to a ton of teams and I was passing runners just about every 1,600 meters. Runners were tired and beat-up, but as many were only running 3-miles at this point as part of a 12-person team, people were “racing” this section. Again I settled on a pace right around 7:00 min./mile – and decided to go with it until I could no longer hold it together. Over the past two hours my legs which around midnight were protesting even stepping down out of the Damn Van had started to come around and get with the program. I hit the left half of the roadway and started reeling in the runners in front of me one by one. I didn’t pay him too much attention, but in a few miles, I would find out he was right. I had two more miles of flat road as we approached the 7-mile bridge. I ticked off those two miles in identical 7:01’s. They had shifted the race to the right shoulder of the road after the exchange area so we could run along a bike path approaching the bridge. 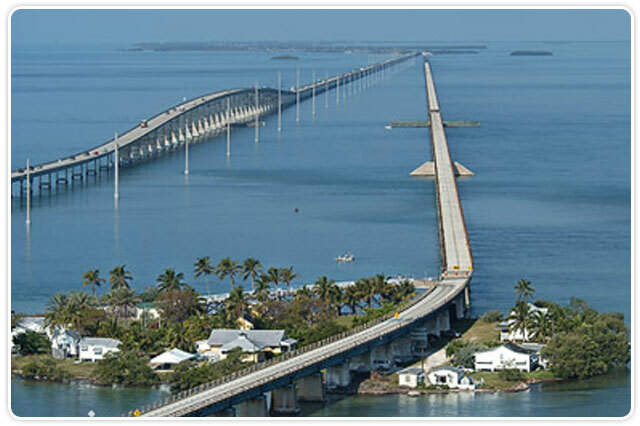 The only issue was that they wanted us to run on the LEFT side of the 7-mile bridge against traffic for safety. As we approached the bridge we went down a small hill to the bottom of a railway tie staircase. We had to run up the stairs, over the pedestrian walkway to the other side of US-1. We then had to come down another set of railroad tie steps and run back NORTH toward the direction we had just come from for 2/10 of a mile and then loop up another set of stairs and finally onto the left side of the bridge. Any rhythm I had to that point was lost trying to navigate the obstacle course, my pace over that mile was 7:55. I forced a smile and said, “I’m just trying to keep it together, I’m not sure how much longer this is going to last.” and away I went. Mile 7 of this leg was nice, smooth and flat and I was able to drop back down again to that comfortable zone. 7:01 for mile 7. The roadway gradually started to climb as we approached what would be the large apex of the bridge which looked like it was a good 2-miles in the distance. I was starting to heat up, my singlet was sticking to my chest, my legs dripping with sweat down into my socks. I hit my Gatorade bottle on my hip a couple of times to try to get some more electrolytes in me, but with just over 4 miles left, I was starting to show a few cracks. Miles 8,9 and 10 came in at 7:10, 7:07, 7:15 and we were finally at the climb to the top. There were runners walking now, a lot of them, just trying to hang in there and get to their last exchange. Oddly, seeing other runners struggling made me feel like I was still in decent shape. Sure I was tired, my feet hurt, but there was a sense of having come so far already, it wasn’t time to give in now. I took a few strides and realized that this is exactly the same way I feel in the final 3-4 miles of a marathon. I continued up the bridge with a 7:22 mile at number 11 and a 7:21 at mile 12. Less than 2 miles to go and I would be done. My legs started to really fight me at this point and I just decided to run smooth to the end. 7:30 over mile 14 and a final .72 miles at 7:27 pace. I saw my friend Steve waiting for the slap bracelet and I sent him off on his way. 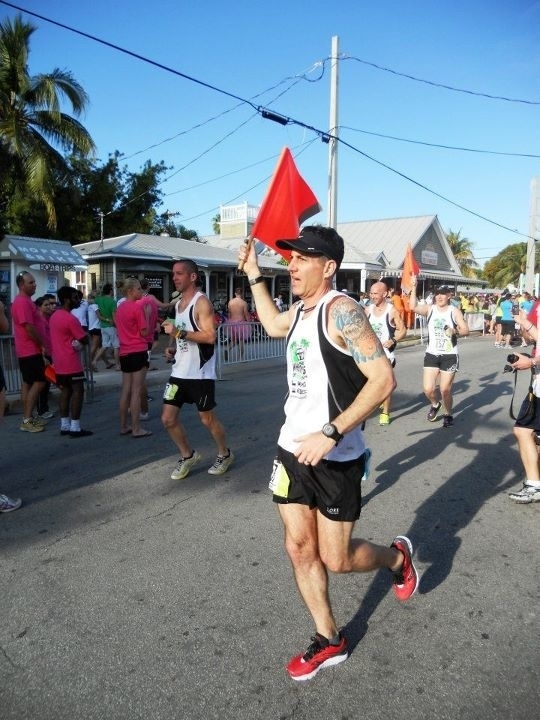 For me, Ragnar Florida Keys was in the books from a running perspective. Now it was time to root home the team and start refueling and recovering. 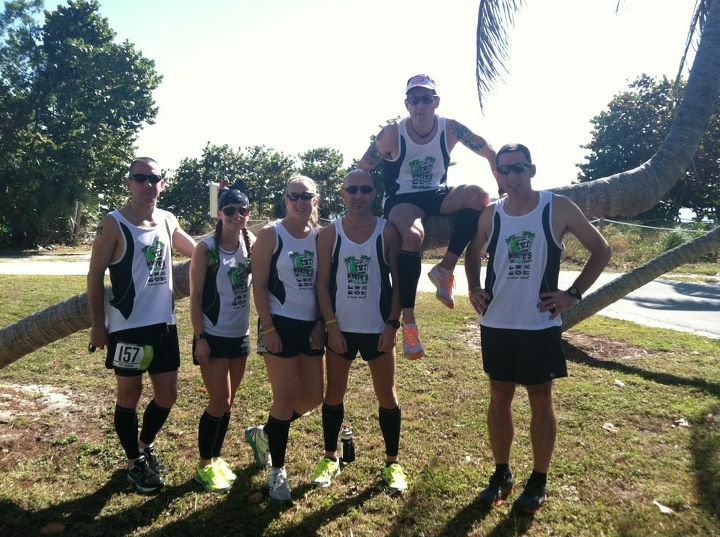 Final Legs: Steve, Thomas, Jenny, Ally and Sean all ran strong through to the finish. The sun was beating down and it was getting awfully hot out there. I was very impressed with the way all of our runners kept it together and kept pushing. Sean had one of the longer final runs of 10 miles. I met him at the mid-point of his run with a second water bottle that he poured over his head – drenched head to toe, running hard, 5 more miles to the finish line. All I could do is smile as he passed me by. He was a frickin’ warrior. So proud of him. We drove the Damn Van to the hotel at the finish area, got back into our “previously worn” sweaty singlets and waited for them to call our number. At just a few ticks before 4:00 p.m., Thomas yelled to me, “Here he come’s let’s go!” – and we all hopped back onto the course to run the last 1/10 of a mile with Sean as we crossed the finish line as a group. Team Time – 27 Hours, 1 minute, 50 seconds. 8th place among the Men’s Ultra Teams (teams need 3 female runners to qualify for mixed, we only had 2), and what appears to be 31st place overall out of more than 500 entries. Pretty darn impressive for a 6-person ultra entry. My final totals were 36.59 miles run in 4:20:25 – 7:07 pace. 5 Years earlier I ran my first marathon in 3:58:08 in Philadelphia – 9:05 pace. 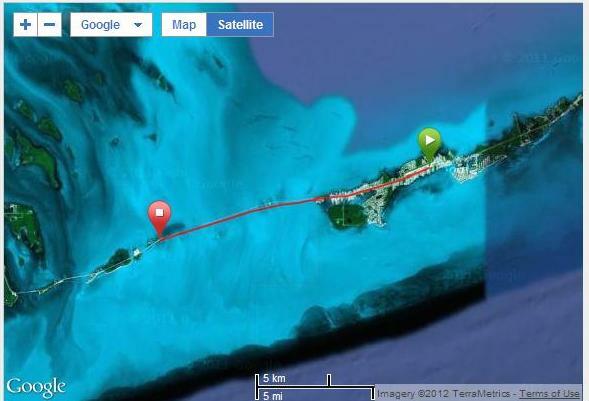 Kinda like Ragnar Florida Keys – What a long strange trip it’s been. Steve, Thomas, Jenny, Ally, Sean and John (our driver) – thanks for the amazing adventure – I can’t think of any 6 people on earth I’d rather be stuck in a stinky, smelly, hot, cramped van full of sweaty clothes and perishable items with for 199 miles … you guys are the greatest! As for “Where’s the Damn Van? !” – we’ll be back before you know it – coming soon to a race near you. Great job, great read. Interesting and informative. Huey – thanks for the message! I think that once you have that “breakthrough” race, where you know that it is supposed to feel hard … it’s hard to turn that back off. Never for one moment did I think I would run those paces for more than 36 miles, but when I was out there, I never once thought of doing anything differently. The mind and body make for strange bedfellows that is for sure. Hope you are great! Great report and phenomenal performance Joe! Congrats to the whole team. 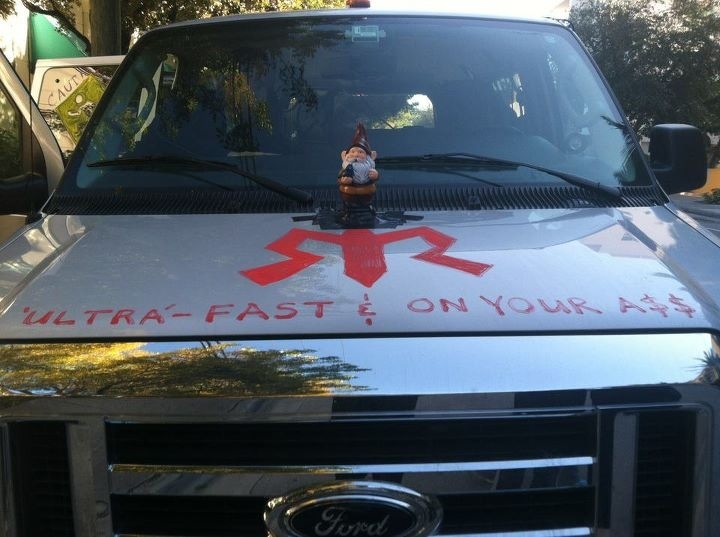 I’ve been itching to do a Ragnar for the better part of a year now and I think this just pushed me over the edge. Rob – I think Nike says it best. Just do it! You will absolutely have a blast, no question about it. I’m not sure if we’ll run as an “Ultra” entry again, although, knowing us after a couple of months, we’ll forget how hard it was and sign up for more torture. The team aspect of it is truly the gift. 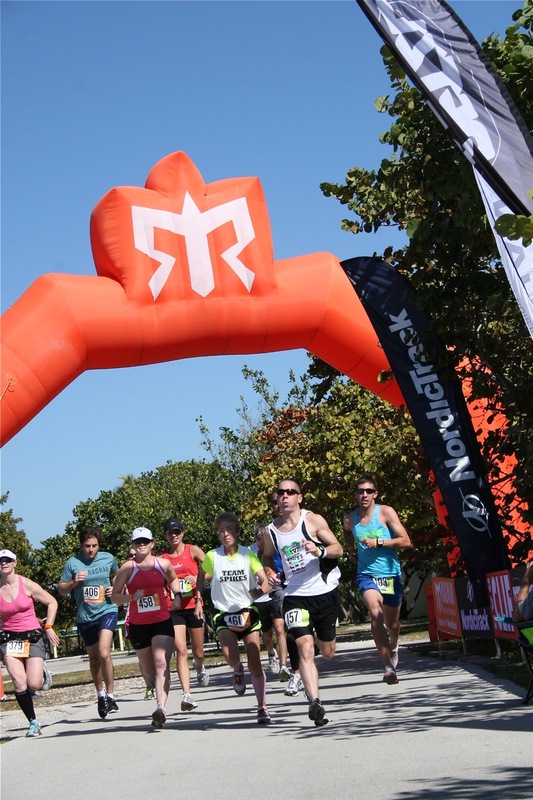 We just don’t get to do that as runners at our age – Ragnar does an awesome job and the race locations literally have something for everyone. Great read, sounds like a great race!!! Pretty darn awesome! Read every single word… We have a short relay coming up soon in Panama, from Colon to Panama City, about 84k total with 10 folks. Marvin – you guys are going to have a blast! Just bring a lot of shoes, a lot of socks and changes of clothes – staying warm and dry in between runs and cool and dry during them are the key. Best to you! Thanks for the write-up Joe … impressive feat well recorded. You and your team have my sincere admiration. Holy Cow, Joe – you guys are studs. I might do okay with the mileage (although not near the speed as you guys) but I would really struggle with the no-sleep thing. Super impressive! Thanks Erin! I think you would be surprised at how little the sleep effects you, your legs just seem to know what to do when it is time to run …. but the next day. Ugh. Really can feel the need to reload. Best to you in Arizona this weekend! Lay down something special out there. Great report, Joe! From reading this and Steve’s recap, it sounds like you guys had a blast. And I’m amazed at the paces both of you held for those distances. This report has made me give some serious thought to participating in a relay someday. JT – it was a pretty amazing experience to be honest. I think Steve and I were a little surprised at the paces we held on to for the relay. He’s on another planet of course, but I think if nothing else, these will be some tough miles I can draw on late in the game at Boston. Wow! As a really new runner (couple of years) and a very slow runner, I’m really impressed with the ultra runners! I loved reading your write up. Doubt I’ll ever be at this level, but I finished Ragnar FL Keys for the 2nd time and feel I’ve grown from each event. Waiting for my shins to heal (damn Canal Road) and then I’m hitting the pavement again. Thanks for the inspirational writing! BTW, I found your site by googling for a picture of Canal Road… I just can’t believe that road! Thanks Joe!! And yes, canal road continues to haunt me! I still haven’t started running again. Another week maybe. I don’t want to start back at square one with the shins and I still “feel” them. Ugh! Thanks for the reply,,,,, it means a lot! Keep running! These Ragnar races are really fun to follow. Sounds like a great challenge, but a true adventure. Great running on each leg, especially those where you had to navigate stairs and climb a Florida hill (aka overpass/bridge.) I look forward to the Damn Van’s next appearance! Hi Nicholas! Thanks for the visit and the message – Sounds like the next trip will be out West as Vegas and Napa have been bandied about – this is a great distraction from all of the more “serious” races throughout the year, and a great chance to hang out with some good runner buddies – hope you are great! Looking forward to this year’s TRI season. Hey, I enjoyed reading your blog on the Keys. I was in a 12-man team that started around the same time. I have a photo of the words on the front of your van, which I will be adding to my photography website in the new running gallery I am creating. Great job on the relay!! Especially with the bridge and Everglades. Ragnar was a blast!